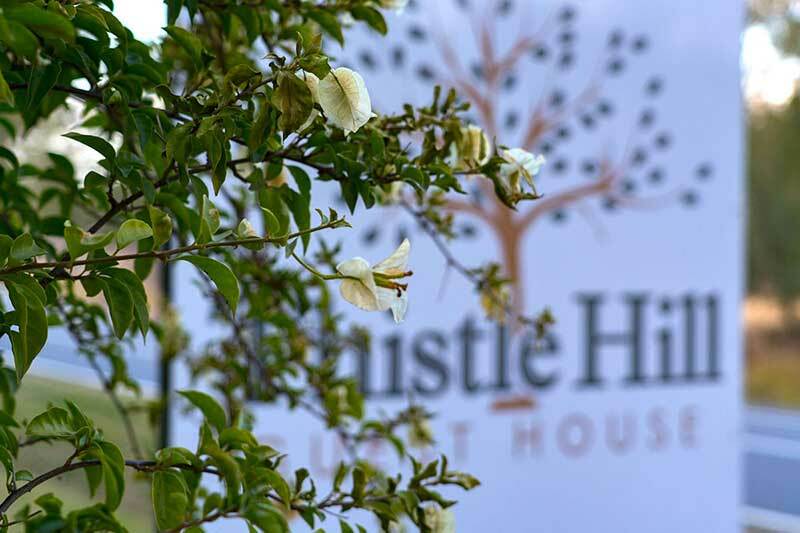 Set well back from the road, Thistle Hill Guest House is nestled amid 20 acres of gardens, native trees, dams and our own vineyard. The feeling is so tranquil and relaxing it is hard to believe you are only minutes from some of Pokolbin’s finest wineries, restaurants and attractions and right in the heart of the renowned “Around Hermitage” area which has become known for its boutique wineries and globally recognised restaurants. Weekend reservations are 2 night minimum stay (Fri+Sat or Sat+Sun). Weekday reservations (Sun-Thur) do not have a minimum stay. When staying more than 2 nights, guests can enjoy a complimentary cheese platter and a bottle of wine on arrival. Thistle Hill Guest House is modeled on a French Provincial farm house with covered verandahs on all four sides. 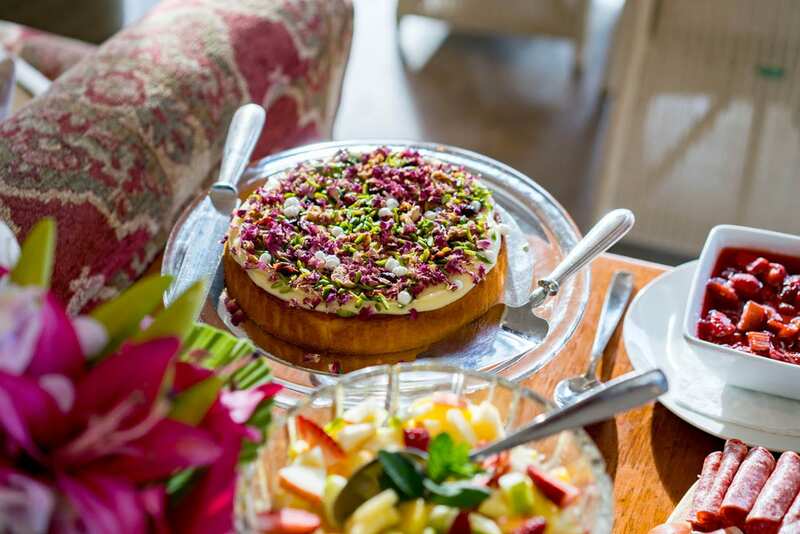 There are three buildings – the main Farmhouse with Guest Suites, our inviting Breakfast Room with views of the property and the self-contained Private Cottage. 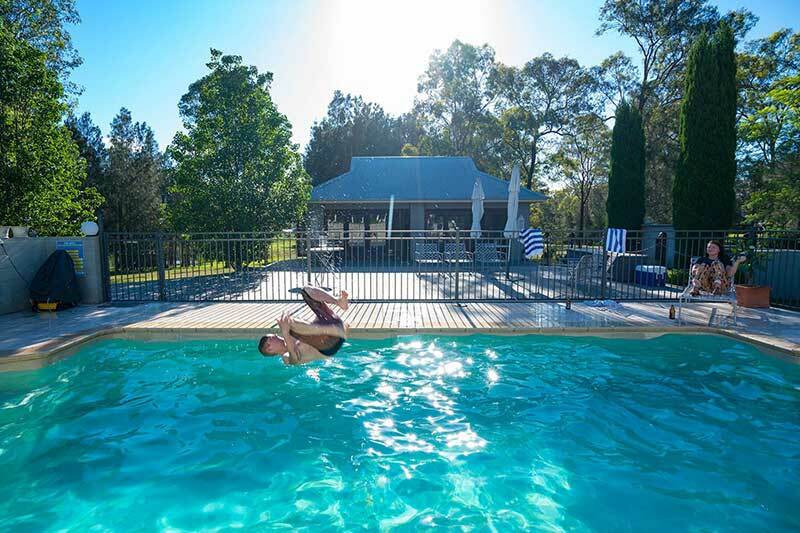 Put on your togs, grab your towel and don’t forget the sunscreen – Thistle Hill’s pool is just the thing for a hot summer’s day! We also have a barbeque and plenty of outdoor seating for an afternoon repast or pool party. Thistle Hill has its very own vineyard and bottled wine. The vines start blooming in September/October all through summer. 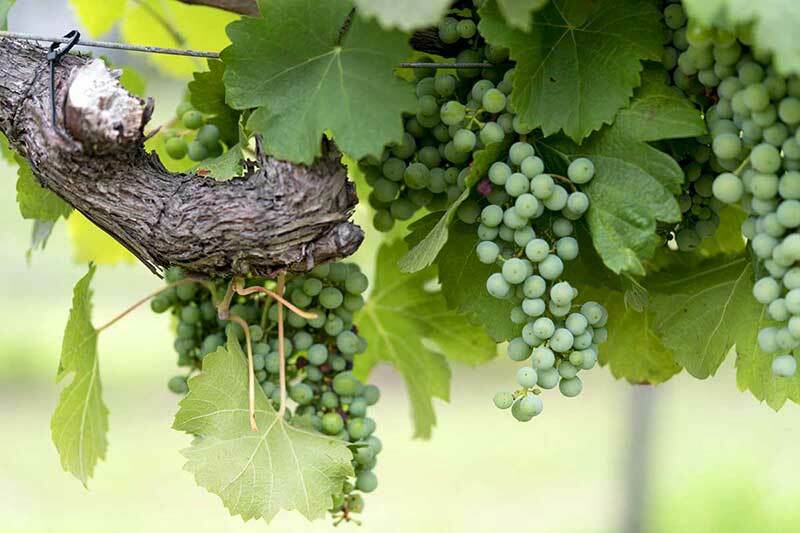 Grapes are ready to pick from late January through early February on red or white – our grapes are white. Vines are clipped in March/April but we don’t consider there to be a season end. Stroll through the vineyard and capture a selfie among the vines. 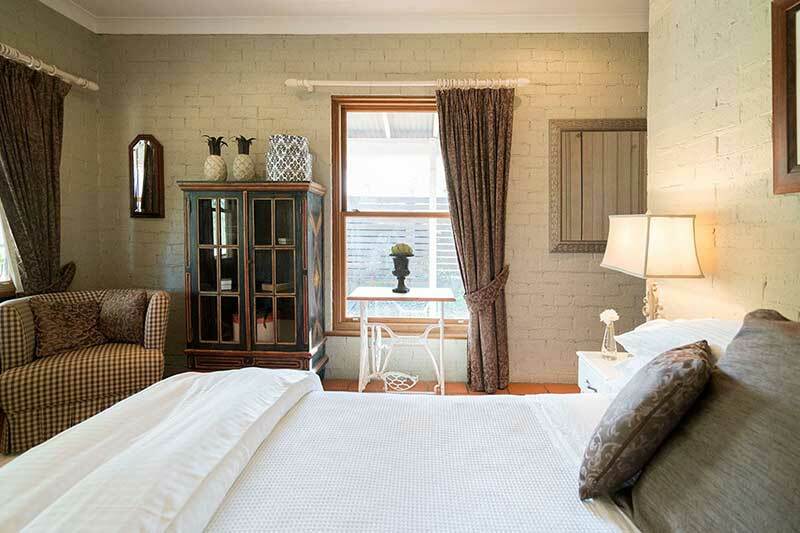 We are all about comfort at Thistle Hill and our suites are well-appointed with soft furnishings and fabrics that harmonise with the French Provincial Farmhouse feel. We have eight comfortable Guest Suites and a large private residence called The Cottage. 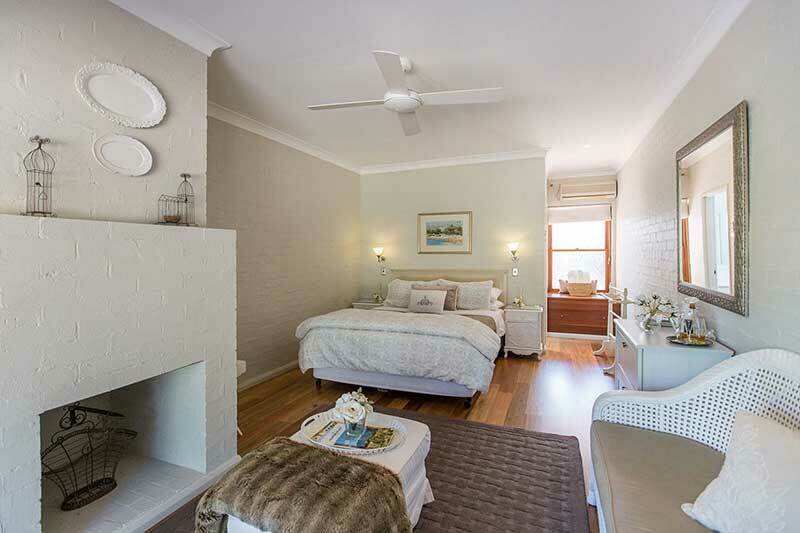 Bright and airy, all of our Guest Suites feature French doors that open onto covered verandahs with private seating, Spotted Gum timber floors, lounges, Ottomans, cushions, throw rugs and Queen size beds. We can also include a single bed should you require one. Luxury bathrooms appoint all rooms. 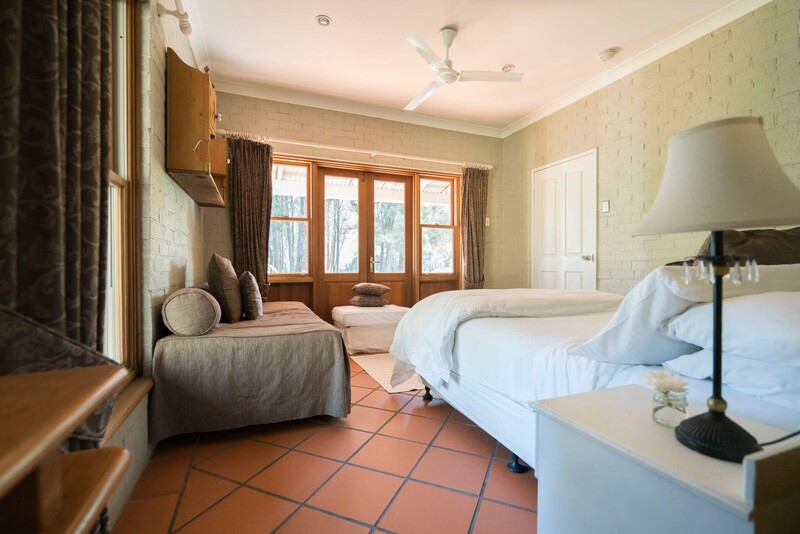 The Cottage features two bedrooms each with its own luxury bathroom, an open plan living area with kitchen, expansive French doors, high ceiling with exposed timber rafters and large terracotta floor tiles. Our Guest Suites continue the French Provincial theme with rustic white-washed walls, Spotted Gum floors, French doors and muted tones. Each suite is air-conditioned, has coffee and tea making facilities including a bar fridge, recharging points for your devices, free wifi and a luxury bathroom. 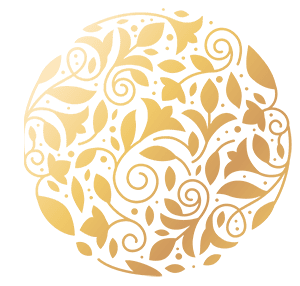 All of our suites have luxury bathrooms with huge rainforest showerheads, as well as a large assortment of quality eco-friendly bathroom products supplied such as shampoo, bodywash, handwash and moisturiser. 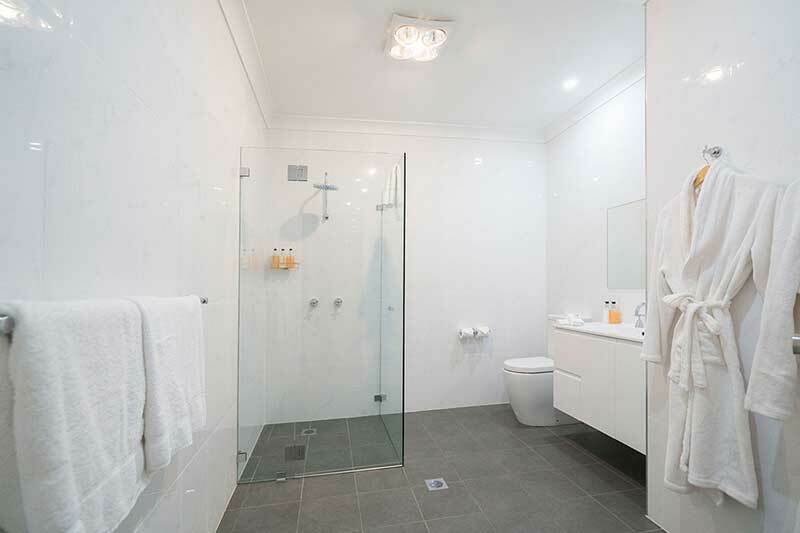 All bathrooms feature instantaneous hot water so your shower will never go cold. The two bedrooms in The Cottage are bright and airy with French doors and sash windows on two sides. They feature rustic furniture, Queen size beds, en-suite bathrooms, large terracotta floor tiles and beautiful drapes. Breakfast time at Thistle Hill is an event to start the day. If you follow our Instagram page you will see what we mean. Our Breakfast Room sits separate from the main building over near the pool (hey – did we tell you we have a pool?) The room features full length windows on three sides with commanding views of the property. We start cooking at 5am to make sure your breakfast selection includes freshly baked items along with a variety of cereals, meats, fruits, compotes, yoghurts, juices and of course coffee and tea. 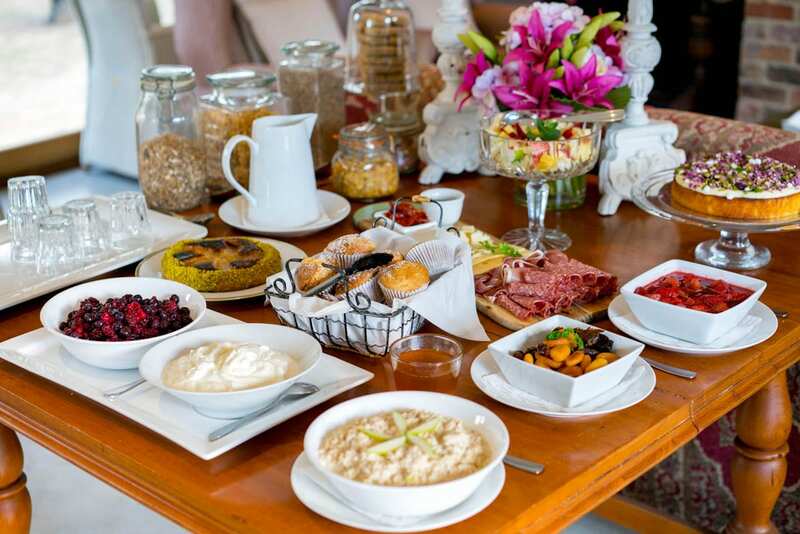 There’s always plenty to go round and more than enough for anyone looking for a big breakfast before they head out to spend the day visiting the local wineries. From the moment you step out of the car at Thistle Hill your relaxation starts. Donna and Stuart's friendliness, professionalism and just lovely welcoming gestures are the perfect start to a weekend away. Fantastic location on approx 10+ acres, wander thru the vines, sip wine and nibble cheese by the dam, play with the puppies.. hard to choose what made it so lovely. Our room was so comfy with everything we could need.. including a nightcap surprise of brownies and cognac when we returned from our night out.Breakfast in the nook the next morning with home cooked treats and the most beautiful breeze blowing through was a great start to our final day there. Most definitely will return. 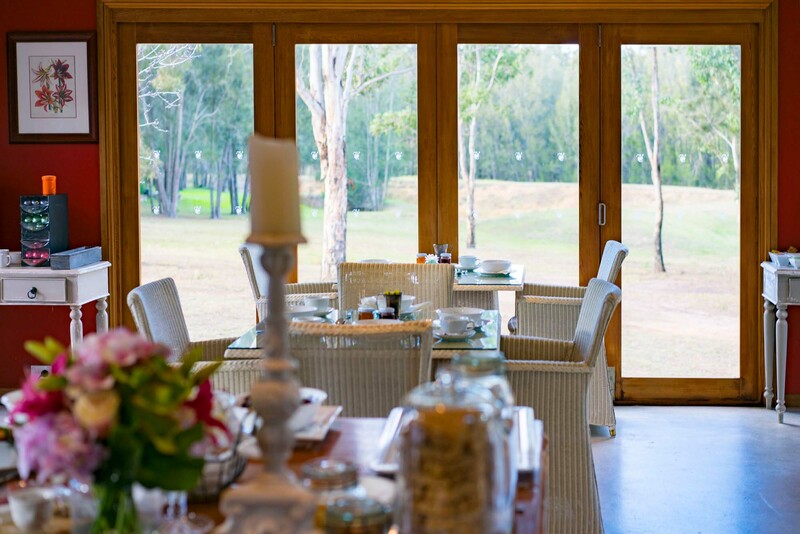 An amazing location in the Hunter Valley, close to some awesome wineries and a distillery and micro brewery. 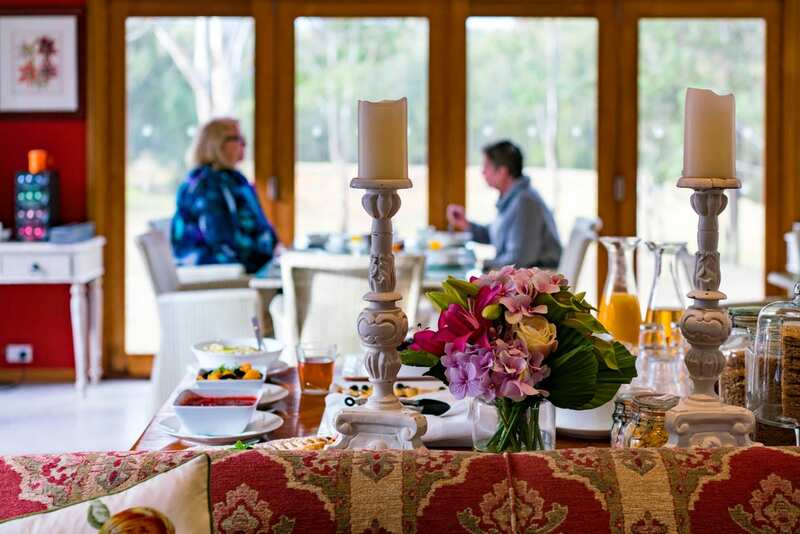 The couple who own and manage the guest house are the most accommodating people you will ever meet, the included breakfast is a great way to enjoy the morning. Our room was sizeable and comfortable, the bathroom looked newly renovated and the bed was great!  My wife and I head to the Hunter at least twice a year and since staying at Thistle Hill last year we will not stay in any other accommodation. 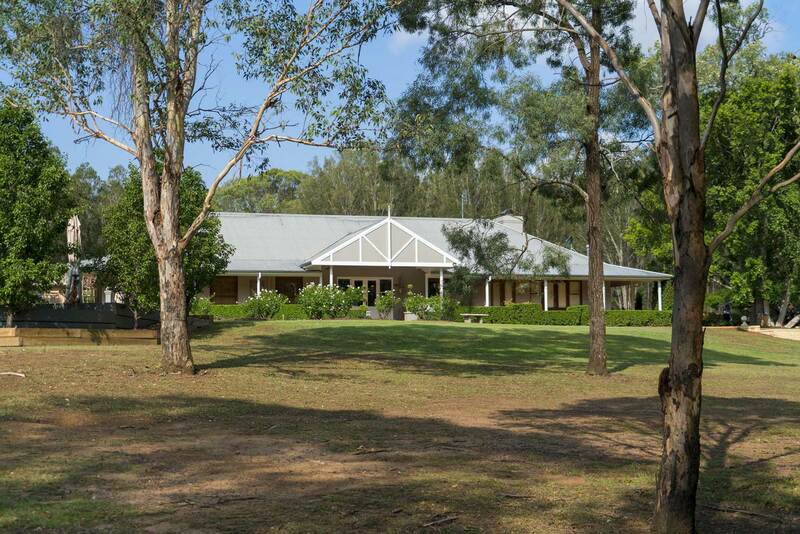 The location is perfect with some of the best of the Hunter wineries right down the road and not in the thick of it of the bigger commercial venues. If friends ask where to stay this is the only place i recommend! Great experience all round. Well hosted by Donna and Stu. Comfortable rooms and close to all of the wineries and great food options. Would heavily recommend. Beautiful location, luxurious country style private rooms with all comforts. Close to Vineyards with breakfast restaurant on site. Incredibly helpful and friendly staff. Expansive gardens and grounds to explore. Would definitely stay here again. Unsurpassed service. Donna is a wonderful host. Great advice, great location, nice rooms, very relaxing. Could not ask for more for a weekend away in the Hunter.